On Tuesday 10 October, a statement released by Justice Committee chair Mathole Motshekga announced that the committee had “resolved to hold an inquiry into Public Protector Adv Busisiwe Mkhwebane’s fitness to hold office”. Fast-forward two weeks, and it took the same committee only a few hours to resolve NOT to hold an inquiry into Mkhwebane’s fitness to hold office. Fourteen days is a very long time in politics indeed. By REBECCA DAVIS. How do you have a discussion about the Public Protector without being able to discuss the Public Protector? This was the conundrum faced by opposition MPs in Parliament’s Justice Committee on Wednesday after ANC chair Mathole Motshekga agreed with ANC MPs that committee members could not “cast aspersions on the heads of Chapter 9 institutions” – such as the Public Protector. The committee had met specifically to probe Mkhwebane’s fitness as Public Protector, following a request made by the DA to Speaker Baleka Mbete. The DA wrote to the Speaker to ask Parliament to consider the matter following Mkhwebane’s instruction to Parliament to change the constitutionally enshrined mandate of the Reserve Bank: a move the DA charged was a “gross over-reach” of the Public Protector’s powers. Mkhwebane made the Reserve Bank recommendation – which amounts to an instruction, following the Constitutional Court’s prior ruling that the remedial powers of the Public Protector are binding – as part of her report into the apartheid government’s bailout of Bankorp. In her Bankorp findings, Mkhwebane recommended that Parliament amend the Constitution to ensure that the Reserve Bank focused on the “socio-economic well-being of the citizens”. She did so after a meeting with lawyers in President Jacob Zuma’s office to discuss her Bankorp investigation. Mkhwebane’s recommendations caused alarm not only in financial circles but also as a result of the advocate’s apparent misinterpretation of the law. The North Gauteng High Court set aside Mkhwebane’s remedial action in August. Following the DA’s subsequent request that the Public Protector’s conduct be “closely scrutinised by Parliament”, Speaker Baleka Mbete referred the matter to the Justice Committee. Committee chair Motshekga made it clear during the committee’s first meeting on the subject that he was opposed to the committee handling the topic, pointing to its “huge workload” and suggesting that an ad hoc committee be established to deal with the matter instead. This was a proposal met with approval by opposition parties, due to a suspicion that Zuma-supporting ANC MPs in the committee would see to it that the matter was buried. Motshekga and the opposition were out-voted by ANC MPs, however, who used their numerical majority to determine that the committee would deal with the matter in-house. Factionalism within the ANC was then brought to the fore once again when both ANC Chief Whip Jackson Mthembu and ANC spokesperson Zizi Kodwa slammed the committee for even entertaining the DA’s request, terming it “a malicious witch hunt”. “Parliament’s Portfolio Committee on Justice and Correctional Services today resolved to agree to a request to hold an inquiry into Public Protector Adv Busisiwe Mkhwebane’s fitness to hold office,” read the statement released by Motshekga’s office following the first meeting. “The majority [of the Justice Committee] felt that the committee is the correct forum/mechanism to deal with such an inquiry as it performed oversight over the work of the Office of the Public Protector. The committee further resolved to hold these meetings outside of normal parliamentary hours, after hours or over weekends, should there be a need for it,” it stated. When the committee met again on Wednesday, however, it was as if the previous resolutions were nothing but a fever dream. While opposition MPs tried to get the inquiry’s show on the road – with Breytenbach proposing that witnesses including the Public Protector be called – ANC MPs disputed the basic terms of engagement. This time around, it appeared that chair Motshekga was acting firmly in concert with his caucus colleagues. 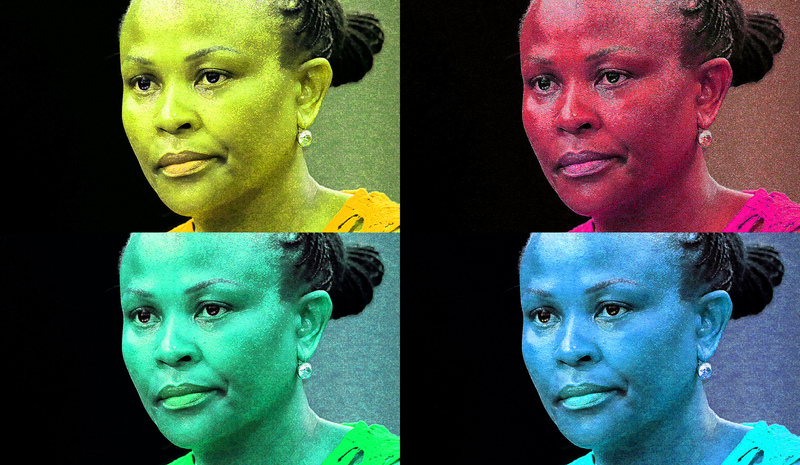 ANC MPs were firmly of the opinion that there was, in fact, no need for an inquiry into Mkhwebane – characterising the DA’s request as part of a wider vendetta against the Public Protector. “It is common knowledge that the DA never wanted the Public Protector right from the beginning,” charged ANC MP Madipoane Mothapo. Yes, the Public Protector had “made a mistake” in calling for the Reserve Bank’s mandate to be changed. Was one mistake sufficient justification to call for her removal from office? “Then we would be removing a lot of judges,” said Mothapo. The comparison of the Public Protector with a judge was picked up with alacrity by other ANC MPs – despite DA MP Werner Horn pointing out that when previous Public Protector Thuli Madonsela argued before the committee that her powers were analogous to that of a judge, she was “vilified” for it. ANC MPs and allies sought to paint Mkhwebane as a fearless challenger of monopoly capital, suggesting that the real reason why the DA wanted her gone was because she had ordered ABSA to pay back the money with which the apartheid government had bailed out Bankorp. “I will never at any stage defend the shareholders of the West,” declared National Freedom Party MP Sibusiso Mncwabe. Mncwabe said that an inquiry into Mkhwebane would only “destabilise this office”, and that as MPs “we are the ones who must guard and protect the stability of the country”. Members of the DA, EFF and ACDP were left expressing growing disbelief at the turn the meeting had taken, contending that there was more than enough evidence in the DA’s request letter alone to warrant an inquiry into Mkhwebane’s fitness to hold office. But with head-spinning speed, chair Motshekga instructed the committee members to vote on whether there was a basis on which to hold the inquiry. Six ANC MPs voted down four opposition MPs. And just like that, the meeting was adjourned.